There was a period in my life when I would use the same pot for everything I cooked. But through hands-on experience over the years, I've come to realize that each pan has it's purpose and quality is equally important. Today when friends and family ask me for cookware recommendations my first suggestion is always Hammer Stahl. Though I realize that Hammer Stahl may be out of budget for some, I truly believe you get what you pay for when it comes to the quality of their products. Made in the US, Hammer Stahl offers 7-ply American Clad Cookware that is induction ready (this is important for those with an induction cook-top). Attention to detail is something they value and it shows in the quality of each handcrafted piece. The company's mission is to spread the value of home cooking by offering top quality kitchen tools for all. I have several pieces from the Hammer Stahl collection, including my most recent addition of the 8.5 & 10.5 fry pans. These pans have quickly become an important part of my everyday cooking routine. 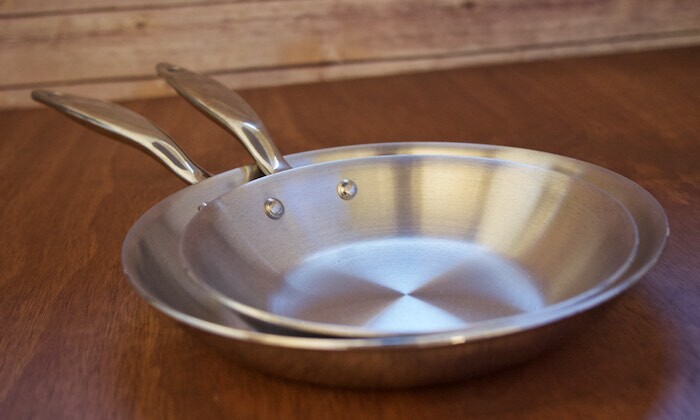 They are perfect for sauteing vegetables and/or searing meats. They are oven safe, and have a unique hollow handle construction which keeps them from burning my hands. I am always happy to work with new Hammer Stahl items in my kitchen and I think you would be too! So much so I am partnering with them to offer my readers, that's you, a 30% discount on products! Now through September use the discount code foodhunter at checkout to get this special savings. I have an ongoing relationship with Hammer Stahl. I receive product and/or compensation for posts featuring their products. As always, all opinions are 100% my own. Hammer Stahl make some seriously fantastic knives! I'm always amazed I don't hear more people talking about them. I've never checked out their cookware, though. I'm on it! I've never tried their products. I think I need to change that. I sear meat a lot so they'd be perfect for me. Everyone I know that has their products loves them! I have never heard of this brand, but I do love some good cookware. The pans are absolutely stunning. I've never tried this brand before, but it sounds like great stainless cookware! I too have never heard about this brand but they are beautiful. They sound like great pans! I have never heard of this brand. After reading this I will have to check them out. I haven't heard of this cookware brand but it sounds amazing! Fantastic post you have share here. I read your job in details and I have gotten more information on Hammer Stael Cookware . I will take this inspiration and apply it to my Arizona The Daring Cooks by immediately placing Mealy your delivering the lovely like a fairy godmother. New to me but they look good! Good quality cookware is so worth it!